This is just a heads-up to let you all know that I will again be out of town starting Sunday, July 1st until Saturday July 7th. During this time our phone system will be down, however, there will be someone available to answer your emails. Any purchases made during this week will not be shipped until I return. I'm so sorry for any inconvenience. Summer 2012 Collection is released! The 6 new designs in our Summer 2012 Collection are finally released as we promised! It has been a long project, but I hope everyone is pleased with the results! On a side note, I am out of town from June 17-23. For this reason, if anything is ordered from my site it will not be shipped until I return. In addition, our phone lines will be down as I have no reception where I am going. However, please send any questions to our email address, yoreclothes@ntelos.net , and there will be someone here to answer your emails. Also for this reason, I will not be publicizing the new items until I return to help with the backlog of orders. All this to say that if you do want to order something, go ahead and do so, but know that they will not be shipped as quickly as they normally would be. Time is closing in on our release date for the Summer 2012 Collection! The date is still June 15th, and I really do have to release tomorrow (the 15th) because I will be out of town for a week. I would hate to have to keep these off the internet for that long, but believe it or not, getting a new design out there is alot more work than one would think. Find an idea that I like - this often amounts to months of research. Decide which colors/fabrics/trims to use. I am very indecisive, so my wonderful Mother is of great help to me. Find someone of historical interest for inspiration. This is harder than it sounds in many cases. Draw up the pattern and test with muslin or scrap fabric. Sew and finish the new dress. This takes much more time than a dress normally does because I often have no idea what I am doing. Take the web pictures of the dress. Make the slideshow pictures for the homepage. Write up a complete description of the dress, including biographies and fashion information. FINALLY I add it all to the website, post on Facebook and this blog, and send out an email blast. This process usually takes about 2-3 weeks. This time around I am trying to do most of this in 3 days. Oh dear. It will get out eventually! Thanks for your patience! The HEAV was incredibly successful! I am thankful, and I now have 5 days to recover before I am gone for a week. I am still shooting to release the new designs this Friday, but some might have to wait until I get back! We are packing up and leaving on Thursday of this week to go to Richmond, VA! 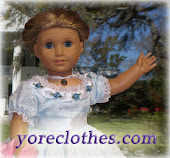 The annual HEAV (Home Educators Association of Virginia) Convention is June 7-9 and 'Doll Clothes of Yore' will be one of the exhibitors! And this is also why the date for the Summer Collection 2012 debut is later than I wanted it to be! I've been scrambling to get ready for this weekend.